Khurshid Manzil is located near to the Tarowali Kothi or royal observatory. The building of the two-storeyed, miniature castle-like edifice was undertaken during the reign of Nawab Saadat Ali Khan. The Nawab had planned to gift this palace to his favorite queen Khurshid Zadi, the mother of heir apparent Ghazi-ud-din Haider. Both Saadat Ali Khan and his wife died before the construction could be done. The building was finally completed in 1818 in the reign of Ghazi-ud-din Haider, who, honouring the wish of his father, named it Khurshid Manzil after the name of his mother. 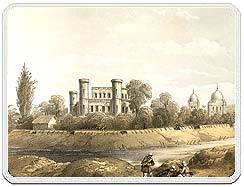 Khurshid Manzil, having big central dome, and eight very distinctive towers, topped by battlements, was designed by Captain McLeod. The Kothi was bounded by a moat known as Chiraya jheel. Khurshid Manzil was later given to the British, who renamed it the 32nd Mess House. The building became a stronghold of freedom fighters in 1857, when after a stretched siege Captain Wellesley was capable to overcome it.